Bone was set in a dessert in ancient times. Bartleby is the main character of Bone. He's a very large bone with a long neck and nose. Bartleby complained continuously about the hot and dry weather in the desert. Roque Ja is a purple rat-like creature with big ears and big eyes. Roque Ja is very quiet and sensitive. The last character is Rock Jaw a male lion with a bad attitude. Rock Jaw was always picked on by bartleby and Rock Jaw because he didn't have a mane like most male lions. The main plot of Bone is about two friends, Bartleby and Roque Ja pick on Rock Jaw the lion. Rock Jaw does not have a mane and the two friends call him a little girl. Rock Jaw 's feelings are hurt. He plans on hurting them by eating them. Because everyone knows a lion can kill a rat and a bone. The story is about the lion attempting to eat Bartleby and Roque ja and for them to find different ways to survive. 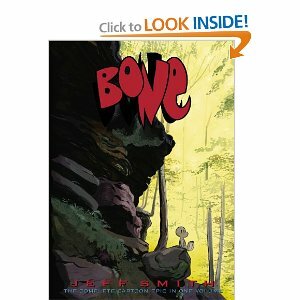 My opinion of the book Bone it's funny but at the same time a learning experience. It exceeded my expectations because I never thought this story could be this serious and important.